Propping your legs up on a vehicle’s dashboard could break your body for life. Airbags deploy at between 100 and 220 miles per hour, and could “send your knees through your eye sockets” in the event of a crash, Tennessee’s Chattanooga Fire Department warns. The message, one the department shared last year, too, is a frightening one that a Georgia woman is all too familiar with. 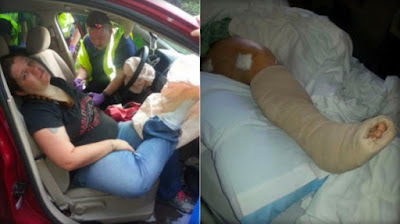 Two years ago, Audra Tatum had her legs crossed with one foot on the dashboard when she was involved in a crash that deployed the airbag, sending her foot into her face, CBS News reports. Besides her nose, Tatum broke her ankle, femur and arm, telling CBS she still walks with a limp and can’t stand more than 4 hours at a time. Why would anyone put their legs on the car dashboard before? Was it made for legs?